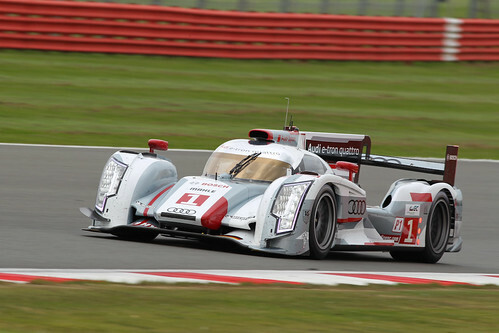 Audi clinched the 6 Hours of Silverstone after an intriguing and tight tactical battle with Toyota to take the manufacturers title in the inaugural FIA World Endurance Championship after just four rounds. Andre Lotterer guided the #1 Audi R18 e-tron quattro over the finish line, 55 seconds in front of the sole Toyota TS030-Hybrid entry with the #2 Audi R18 ultra completing the podium places. Lotterer now leads the WEC drivers championship with team-mates Marcel Fassler and Benoit Treluyer. Alexander Wurz, Nicolas Lapierre and Kazuki Nakajima meanwhile secured a podium in only the TS030's second race. It was a constant threat, taking the fight to Audi from the start and leading for long spells. The e-tron's ability to run far longer stints - coupled with a providential late safety car - ultimately decided the contest however, with both R18s able to make one less stop across the six hours. The differing pit schedules only added to what was a fascinating contest, with the TS030 building upon its Le Mans promise and proving an equal for the Audis on single-lap and long-run pace. That was apparent from the opening half hour when Wurz first jumped Tom Kristensen's Ultra and moved into second at the start, before closing down and then passing Lotterer's e-tron for the lead of the race as the pair fought their way through traffic. Wurz began to stretch away but pitted after just 22 laps, compared to Audi's stops on laps 25 and 26. That marked the start of a continued swapping of the lead by the #1 Audi and #7 Toyota whenever the pitstops cycled through, which would carry on until the final hour when a safety car helped Audi's bid to complete the race with seven stops, compared to Toyota's eight.